Charity, fundraising and donation can be made alot easier with an effective promotional strategy with a genuine appeal with our Charity Collection Boxes. You can expose your organisation brandname and logo to signify a message and get your point accross with maximum retention. Brand name awareness can be important around a positive movement from within your organisation and can help people recognise to whom they are donating. 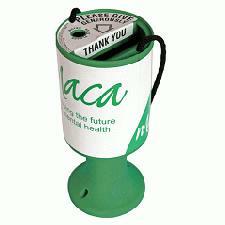 collection box for an all-around exposure of the brandname logo. We also provide alternative product designs including a wrap-around label and a security chain can be also available as an extra. Make sure there is brand awareness, that you signify a message to be bold and clear. State your promotional and people will remember you.